LG plans to introduce three new budget-oriented smartphones at the end of the month during the upcoming MWC 2014. 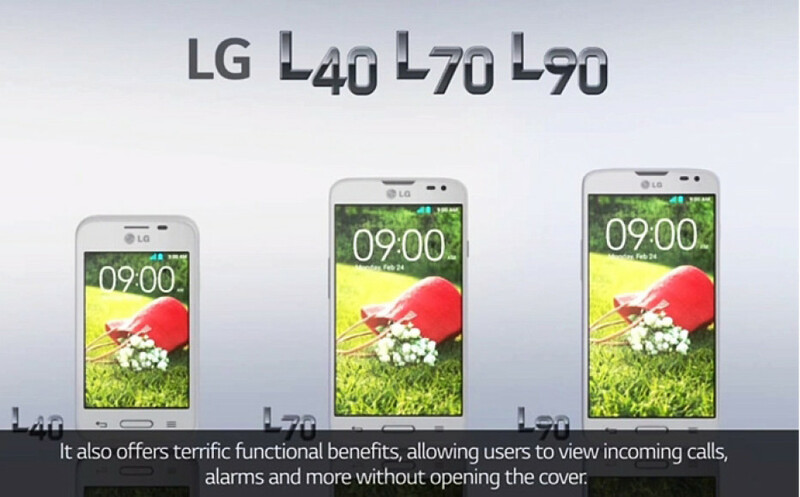 The three models will be known as L90, L70 and L40 and will all run Android 4.4 KitKat. As the name suggests the L90 will be the most powerful of the three – it will have a quad-core processor at 1.2 GHz, a 4.7-inch sensor IPS display at qHD resolution (960 x 540 pixels), 1 GB of RAM, 8 GB of internal memory, a rear 8 MP camera and a front 1.3 MP camera and a 2540 mAh battery. The device measures 131.6 x 66 x 9.7 mm. The L70 is the next one in line and is the second most powerful – it has a 1.2 GHz dual-core processor, a 4.5-inch sensor IPS display at WVGA resolution (800 x 400 pixels), 1 GB of RAM, 4 GB of internal memory, two cameras – one front and one rear at 8 MP and a 2100 mAh battery. The device measures 127.2 x 66.8 x 9.5 mm. The L40 is the slowest of all three – this one has a dual-core chip, a 3.5-inch sensor IPS display at HVGA resolution (480 x 320 pixels), 512 MB of RAM, 4 GB of internal memory, a rear camera and a 1700 mAh battery. The smartphone measures 109.4 x 59 x 11.9 mm. The pricing of all models is unclear at the moment.